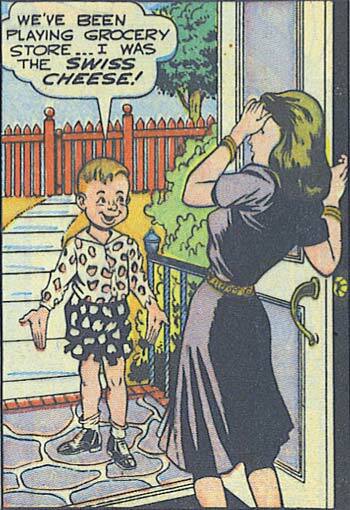 Random Panel: "Don't worry, I got 'em back but GOUDA!" 7 Responses to Random Panel: "Don't worry, I got 'em back but GOUDA!" Mr. Thomson down the block loves to play with me. He tells me to take off my clothes so we can make swiss cheese out of them. Then we take pictures and he gives me popsicles! Oh GOD! I’m starting to think that either you make these up Jeff, or this “Wonder Comics” book was a very VERY twisted read…..
To be fair, this particular panel was from a “jokes” page in the comic, so it was supposed to be funny. That was so sad and funny at the same time. Imagine the poor kid who played the dessicated coconut or sliced ham.